An enthralling literary debut that evokes one of the most momentous events in history, the birth of printing in medieval Germanya story of invention, intrigue, and betrayal. Youthful, ambitious Peter Schoeffer is on the verge of professional success as a scribe in Paris when his foster father, wealthy merchant and bookseller Johann Fust, summons him home to corrupt, feud-plagued Mainz to meet "a most amazing man." Johann Gutenberg, a driven and caustic inventor, has devised a revolutionary - and to some, blasphemous - method of bookmaking: a machine he calls a printing press. Fust is financing Gutenberg's workshop and he orders Peter, his adopted son, to become Gutenberg's apprentice. Resentful at having to abandon a prestigious career as a scribe, Peter begins his education in the "darkest art." As his skill grows, so, too, does his admiration for Gutenberg and his dedication to their daring venture: copies of the Holy Bible. But mechanical difficulties and the crushing power of the Catholic Church threaten their work. As outside forces align against them, Peter finds himself torn between two father figures: the generous Fust, who saved him from poverty after his mother died; and the brilliant, mercurial Gutenberg, who inspires Peter to achieve his own mastery. Caught between the genius and the merchant, the old ways and the new, Peter and the men he admires must work together to prevail against overwhelming obstaclesa battle that will change history... and irrevocably transform them. "The feast of Saint Matthew is auspicious for all business ventures." Fust's teeth were gleaming in the torchlight. Peter waited, long legs stretched out from the willow chair. The heat of the day had left the air of the courtyard warm and scented by the rose, and from the lane beyond he smelled the tang of fruit, the thick hot earthiness of livestock. He heard the call of owls, the intermittent roar out of the gaming housethose old, familiar sounds. "What do you mean?" he asked, when Fust did not continue. "Just that I have a proposition." His father sat upright. Which I may not refuse. "And this is why you called me back." "We have a chance to shape the future." Fust leaned forward, peering at him in the dusk. "You and I together, I mean." "I shape the future now," said Peter, straightening. The novel begins with Peter Schoeffer telling the story to a writer. In what ways are verbal and written storytelling similar or different? What does Peter retain and lose in his shift from artisan scribe to printmaking engineer? Considering Peter's initial conflict between the scribe's art and the printing press, what's the relationship between art and technology? A central issue in Mainz is the ancient one between homo faberthe man who makes thingsand he who sells or trades what others make. What is the conflict here? How might it continue in contemporary culture? Examine the irony of craftsmen making by hand something that would "replace the hand of man." Gutenberg’s Apprentice is my favorite kind of historical novel, the kind that inspires me to stop every couple of chapters and ponder. Alix Christie’s extraordinary book made me want to ponder the tremendous ruthlessness of History (capital H intended), how it takes no prisoners when its gears begin to churn out global change. We see it today in so many ways, but seldom reflect on the individual lives of those who were chosen to mete out those changes. Changes without which nothing in our daily lives would be possible. I mean it. Nothing. (Reviewed by Donna Chavez). Christie's slow-paced debut is rich in historical detail. Although the writing can be overblown, the story of the birth of the printing press is fascinating. Starred Review. Journalist Christie's fiction debut descriptions of technical processes and medieval society are enthralling; the romance and personal melodrama are less compelling. At her best, she demonstrates a printer's precision and a dogged researcher's diligence in her painstakingly meticulous account of quattrocento innovation, technology, politics, art, and commerce. Starred Review. Christie masterfully depicts the time and energy required to print the first Bibles…A bravura debut. Starred Review. Gorgeously written...dramatizes the creation of the Gutenberg Bible in a story that devotees of book history and authentic historical fiction will relish...this wonderful novel fully inhabits its age. I loved this novel! Alix Christie's debut is intensely observed, so much that I felt in the dark rooms of history with the people laboring over the metal and words to bring us print, but also laboring over their own lives and love and survival. The Black Plague had claimed as much as two-thirds of Europe's population in the 14th Century. Life seemed fragile at best, and people who could write felt like it was important to get things down in black and white, to record their stories for posterity. Furthermore, the Church, the medieval everyman's raison d'etre, had pretty much failed them. So some began to question if there was any reason for existence, any meaning to life. It also might very well be credited to plague survivor's guilt that compelled people to seek answers to life's most complicated questions. 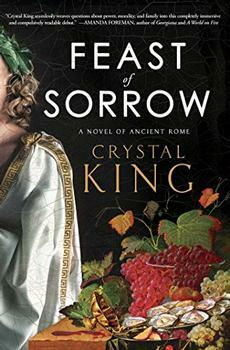 Set amongst the scandal, wealth, and upstairs-downstairs politics of a Roman family, Crystal King's seminal debut features the man who inspired the world's oldest cookbook and the ambition that led to his destruction. A first novel, at once hilarious and tender, about the decades-long rivalry between two publishing lions, and the iconic, alluring writer who has obsessed them both.